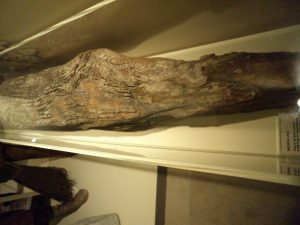 Medieval timber – old Rochester Bridge. Keeping with this nautical theme, I thought I would also report progress on the ‘Maritime Kent through the Ages’ conference to be held at Canterbury Christ Church next year. We now have a date and there will be a keynote lecture with wine reception beforehand on the evening of Friday 22 June. The wine reception will be from 6.30 pm, the Dean of Arts and Humanities has generously agreed to sponsor this, and the lecture will begin at 7 pm to be given by an expert in England’s maritime past. Both the Friday lecture and the all-day conference on the Saturday will be held in Old Sessions House and will be organised thematically. We are intending to have eight speakers on the Saturday introducing four topics: ‘Coastal Topography and the Environment’, ‘Coastal communities’; ‘Trade and Industry’ and ‘Defending the Coast’. This is an exciting prospect and I’ll provide more information as plans develop. Canterbury Medieval Pageant – Award Winner. Another exciting piece of news that concerns the Centre is a Kent Tourism Award for 2017. 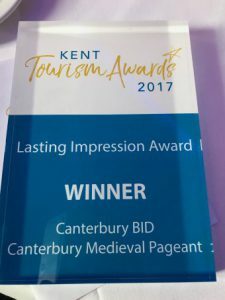 It has just been announced that the Canterbury BID has been given this award for the annual Medieval Pageant, and the Centre has been deeply involved in this celebration of the city’s history since the Pageant began. 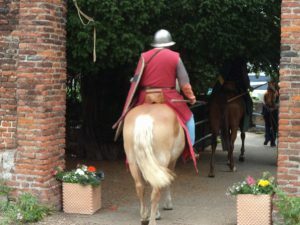 As frequent readers of the blog will know, on a warm Saturday in July 2017 the Centre welcomed over 600 visitors to the Franciscan [Greyfriars] Gardens where the young, and not so young, could design their own shields, or if they preferred could take part in other creative activities highlighting various aspects of medieval life. The Centre’s staff of Dr Diane Heath and I, led by Professor Louise Wilkinson, and with two CCCU students Victoria and Charlotte also hosted a group of medieval re-enactors, including a couple of knights. These men and women, with several children also took part in the parade through the city, beginning at the iconic Westgate Towers. This award is a great endorsement of all the hard work and planning that goes into this event, as well as marking just how successful and popular the event has become in the city’s calendar of history and heritage events – well done Bob and his team! Such jointly organised activities are an important part of the Centre’s remit to use the historical research conducted by staff to enrich events put on at Canterbury Christ Church, in the city, and more broadly across the county. Just keeping to Kent’s coastal communities, as has been reported before, Martin Watts is involved at projects at Whitstable and Dover; Louse, Diane and I are working with Faversham, and if all goes well I’ll be speaking at Ramsgate’s Maritime Festival in June 2018, while Diane Heath will be speaking at Margate’s Turner Centre in the previous month. To this end, too, this week Diane attended a meeting of the Heritage Action Zone at Ramsgate that is looking to enhance the heritage experience of locals and visitors alike of this important coastal town, which has a very good selection of Victorian buildings, albeit many have suffered over the last century. Knightly re-enactors leaving Greyfriars Gardens to attend the parade. The coastal town that has so far developed the strongest ties to History at CCCU is Folkestone. I have not heard recently how the ‘Finding Eanswyth’ project is developing, but I’m assuming more news will come soon from the capable team of Drs Lesley Hardy, Mike Bintley and Ellie Williams, who will be working with the new project manager and archaeologists from Canterbury Archaeological Trust. Hopefully such ties will also develop in the Medway towns, especially after Martin Watts’ involvement at yesterday’s conference, and perhaps, too, at Rochester, which would be very exciting, not least because I have worked previously with Dr James Gibson, Rochester Bridge Trust’s archivist. Finally, I thought I would report on the latest meeting of those postgraduates studying some aspect of Kent history that took place last Wednesday. Peter Joyce gave his presentation first where he focused on the charitable activities of Father Robert Radclyff Dolling, an Anglican priest who for many years ministered to those living in the slums associated with the naval dockyard at Portsmouth during the later 19th century. Peter is particularly interested in this high Anglican churchman because he has a book of his writings, and Dolling has a fascinating background – a child of a mixed Protestant/Catholic marriage from one of the wealthiest families in Ulster – who chose to serve God amongst some of the most deprived communities in Victorian England. He also wrote about his experiences in Ten Years in a Portsmouth Slum, but while massive crowds turned up for his funeral, within a relatively short space of time his fame diminished considerably, and more recently little work has been done on his life and ministry. Peter’s talk was extremely interesting, yet even though he mentioned briefly Dollyng’s sisters, it seemed to me their role in his charitable work would be well worth investigating. In addition, Peter wants to examine whether there were churchmen at Chatham who responded similarly because this should offer an excellent comparable study. 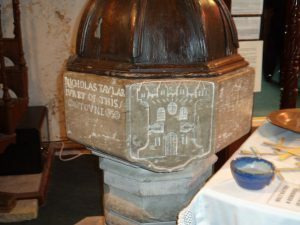 Font at Queenborough parish church. Such ideas about family name and survival were also the topic Andrew Leach chose to discuss in the second half of the seminar. Andy took us back in time to the 12th century where he is investigating three noble families, one of which, the Crevequers, came from Kent. However, on Wednesday he concentrated on the family that held the earldom of Huntington. This family also became embroiled in disputes between the royal families of England and Scotland following the marriage of Matilda to David the son of Malcolm III of Scotland. Concentrating on the disputed inheritance of the Huntington earldom, Andrew took us through the lives of two siblings and their half-brother from a later marriage, two of the boys, Simon and his step-brother Henry, contesting which of them should hold the earldom, while the third brother was destined for the Church. As Andrew showed, negotiation, whether this involved such matters as marriage, patronage and clientage or rebellion, was the ‘tool’ used by families to prosper, or hopefully at the very least survive. Yet, to a degree, if we think about memory and the written record (apologies Michael Clanchy), it was Waldef who is many ways was the family survivor through the transmission of a Vita written about him by Jocelyn of Furness 40 years after Waldef’s death. As a ‘saintly’ senior churchman, Waldef had no children to take up his family name, and even though he never received official recognition as a saint, his cult did live on at Melrose where he had been abbot. These two presentations sparked discussion afterwards, making a good ending to our monthly seminars this term and the group will reconvene in January, and next week I shall hopefully be able to report on other joint projects that the Centre will be involved in next year.